Again, this probably wasn't originally a bestseller, though that term was not well defined in 1881 when the first book edition of Washington Square appeared. But it has certainly sold a lot of copies over time! I had been meaning to finally try Henry James for a little while, and I had even started The Aspern Papers but I manage to misplace my copy. I wanted to start with something short, and early, as by most accounts those are the more accessible books in James' oeuvre. James (1843-1916) published his first novel, Watch and Ward, in 1870. Roderick Hudson, in 1875, seems to be his earliest novel to retain a significant reputation, and the first really major works appeared a bit later: Daisy Miller and The Europeans in 1878, The Portrait of a Lady in 1881. James lived in Europe (mostly England) from 1875, though he seems to me centrally an American writer. Comparisons with his good friend, the much younger Edith Wharton, are easy to advance -- she too lived in Europe (France) for much of her life, but was quite essentially an American writer. 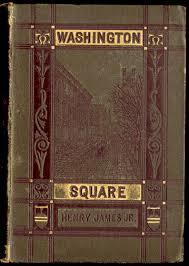 Washington Square was first published in 1880, serialized in Cornhill Magazine in England and Harper's in the US. It was published in book form in 1881 by Harper and Brothers. It remains one of his most popular novels with general readers, largely because of its relative accessibility (I think) -- it is very well written, but in a much less convoluted style than late James, it is quite funny (though not exactly a comic novel), and it is fairly short. (It is not, however, a novella (by my definition), even though it is often called one -- at some 65,000 words it's a respectable size for a novel, if on the short side.) It has also been well treated by the movies. A successful stage version, The Heiress, written by Ruth and Augustus Goetz, ran on Broadway in 1947, and a movie version of the play was made in 1949 by William Wyler, starring Olivia de Havilland, Montgomery Clift, and Ralph Richardson. Much more recently, in 1997, a movie was made based directly on the novel, directed by Agnieszka Holland and starring Jennifer Jason Leigh, Albert Finney, Ben Chaplin, and Maggie Smith. This later version is not so well regarded as the 1949 The Heiress, but it seems to have been decently done. Both versions seem moderately faithful to James' novel. James himself disliked the novel in later years, and refused to include it in the New York Edition of his books. But I, like many contemporary readers, liked it a lot. It's the story of Catherine Sloper, the daughter of a very rich and successful New York doctor, Austin Sloper. Dr. Sloper's wife died shortly after Catherine was born, and their only son also died as an infant. Dr. Sloper's foolish widowed sister lives with him, and she is charged with Catherine's education. Catherine's mother was a beautiful and intelligent woman, and perhaps for that reason, Dr. Sloper, though in most ways a dutiful enough father, never seems to take to Catherine -- he regards her as plain and dull. It's hard to be certain how much of that is Dr. Sloper's opinion, tarnished by unfair comparison with his dead wife, perhaps. That said, the narrator's third person omniscient voice seems to endorse, at least to some degree, this view of Catherine. But for all that she is a very honest person, and virtuous, and loving -- and by the end shows some real steel. It is true that Catherine receives little attention from the men in her high society. By the time of the main action of the book (about 1846) she is twenty-one. At an engagement party for her cousin she meets a "beautiful" man, a distant cousin of her cousin's fiance. Morris Townsend is several years older than him, regarded as gifted, but somehow unable to find a job. He's back from some time spent overseas, apparently. And he pays distinct attention to her -- something she's not used to. Before long she is in love, and he says he is as well. Dr. Sloper, however, is convinced that Townsend is a fortune hunter, and a lazy man who will never make anything of himself. After one meeting with Townsend, he's convinced he has his measure, and he sets himself against a marriage between him and Catherine. His lever is his fortune -- while Catherine will have $10,000 a year from her mother's estate, she stands to inherit twice that again from her father. Over a period of several months things continue in this light. Catherine is firmly convinced that she loves Morris. She is just as sure that her father will remain unbending. Her Aunt Lavinia, a very silly and irresponsible woman, decides that she will be the fulcrum of a great love story, and dangerously abets Morris's attempts to see Catherine against her father's wishes. The thing is, we know all along that Dr. Sloper's estimate of Morris' character and intentions is exactly correct -- but Dr. Sloper, though basically in the right regarding Morris, puts himself so completely in the wrong in his approach to his daughter -- and in his lack of respect for her -- that he possibly cements her resolve. On the other hand, she proves to be a person of great character and resolve anyway -- perhaps she would have been fixed regardless, despite her inability to see through Morris Townsend. After a trip to Europe proves insufficient to make Catherine forget Morris, things come to a head. Catherine is ready -- though unhappy -- to defy her father and marry Morris. Surely her $10,000 a year (equivalent to perhaps $200,000 today) will be sufficient for a comfortable existence, and, anyway, Morris has found a position. (Or so he says.) But Morris proves oddly reluctant to set a date, and finally throws her over. And despite her final realization that Morris Townsend is thoroughly unworthy, Catherine never wavers. She refuses to promise her father that she will never marry him, even though she has no intention of ever doing so. And Dr. Sloper is sufficiently stubborn to hold to his vow to disinherit her. And she goes on to be a spinster her whole life -- despite, eventually, several proposals, one at least from a very worthy man. This can be read as a sad ending -- or it can be read as a woman of character standing her ground and living her own life to the extent that her talents -- and her social situation -- allow. Most readers seem to view Dr. Sloper as the villain of the piece, but to me, despite his flaws and his clear misapprehension of his daughter's strengths, I sympathized with him. Morris Townsend -- and Aunt Lavinia -- seem more truly contemptible characters. All the characters -- but most particularly Catherine Sloper and her father -- are excellent portrayed. The prose is very fine, and as I said not so involved, not so fussy, as the prose (so I understand) of James' later works. And the novel is really quite gently, and sadly, funny. I liked it a good bit. I'm a fan of Henry James. WASHINGTON SQUARE is a terrific novel with a cunning relationship between father and daughter. And it's a clever critique of the marriage process. What more could you ask for? I do think he's a writer you might need to grow into. I wasn't ready for him when I was in college, for sure.